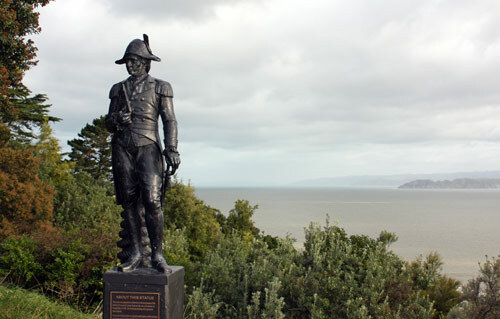 ‘Cook’ looks suitably naval, as befits a ship’s captain, in this statue on Kaiti Hill, overlooking Gisborne. It was erected to commemorate the bicentenary of his visit, in 1969, but in fact is an ‘imposter'. It is a bronze casting of a marble statue imported from Italy, by Captain Cook Breweries in Auckland, and is not a likeness of Cook.